C/NET.com has posted a very informative short video featuring Dr. Gregory Marcus at the UCSF Medical Center who compares a 1-lead ECG from the Apple Watch Series 4 to the results of a traditional hospital 12-lead electrocardiogram (ECG/EKG). Hooked up to a traditional electrocardiogram monitor, C/NET Senior Editor Vanessa Hand Orellana uses an Apple Watch 4 app to take her 30 second ECG reading. Compare ECGs: See comparisons of Vanessa’s readings from her 12-lead electrocardiogram (ECG) monitor and her Apple Watch ECG. Learn the technology of how the Apple Watch captures the heart beat. Dr. Gregory Marcus at the UCSF Medical Center compares a 1-lead ECG from the Apple Watch Series 4 (equipped with the right app) to the results of a traditional hospital 12-lead electrocardiogram (ECG/EKG) monitor. Hooked up to a traditional electrocardiogram monitor, C/NET Senior Editor Vanessa Hand Orellana uses an Apple Watch 4 app to take a 30 second ECG reading. See comparisons of readings from the two devices. Learn how the Apple Watch 4 captures the heart beat. Live footage, animation and interviews. Posted Dec. 6, 2018 by C/NET. 4:26 min. Transcript available. Click on arrow to start video. Hover over video frame for player controls.You can pause playback, turn on closed captions or adjust audio volume. Published by Swedish Heart and Vascular Institute. The Zio® Patch by iRhythm is an interesting advancement in single-use ambulatory heart monitors. It looks like a big band-aid! After use, you return it to your doctor for downloading of the data. 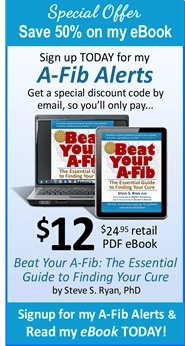 My first-hand experience: I wore one awhile back, after a prostate exam when my heart appeared to briefly be in A-Fib. As a followup, my cardiologist had me wear a Zio® Patch for two weeks. 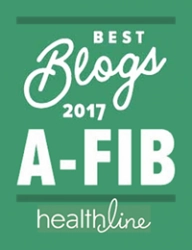 Result: no A-Fib! It turned out to be a one-time occurrence brought on by the medical test. Description: The Zio® Patch cardiac monitor (iRhythm) looks similar to a 2-by-5-inch adhesive bandage and sticks to a patient’s chest. In a new video we’ve added to our library, cardiac surgeon Edward Soltesz, MD, discusses who is a good candidate for the Maze surgical-based treatment for Atrial Fibrillation. The full Maze open-heart surgery is typically performed in conjunction with surgery to correct another heart condition such as valve disease or coronary disease but can also be performed as a standalone treatment. • In-Depth: Mini-Maze Surgery: Inside the O.R. with Dr. William Harris, Cardiovascular Surgeon. 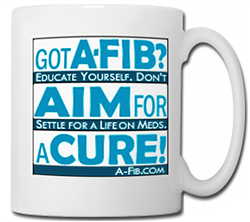 We have carefully selected the A-Fib-related videos in our Video Library. They have been selected for the reader who learns visually through motion graphics, audio, and personal interviews. Our collection of short videos are organized loosely into three levels: introductory/basic, intermediate and in-depth/advanced. 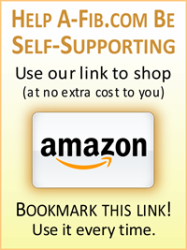 Click to browse our video library. Video: What is the Upright Tilt Table Test? Do you experience dizziness or fainting spells? The upright tilt table test is a simple and effective way for collect important data for a diagnosis. In this short video, Natalie Zalmanova, NYCVA physician assistant, explains the steps of the tilt table test. With footage of in-progress test. (1:15 min.) Posted by New York Cardiovascular Associates on Oct 19, 2012. Posted by University Health News Network, Sept 25, 2017. 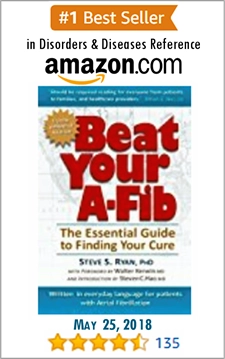 When I developed Atrial Fibrillation, one of my first courses of study was to learn how to read my own Electrocardiogram (ECG or EKG). If this interests you, too, consider my brief overview of the ECG waveform signal and how to “read” an ECG tracing. Go to my report, Understanding the EKG Signal. 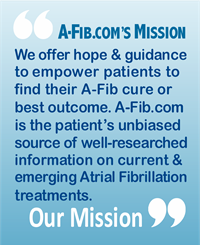 For the reader wanting a more extensive understanding of the Electrocardiogram and A-Fib, we offer you a link to LearnTheHeart.com – a FREE online cardiology resource for those seeking to increase their knowledge of ECG tracings. Start with ECG Basics: I suggest you start with the ‘ECG Basics‘ to analyze each part of the ECG tracing; included are detailed explanations and ECG images of the heart in A-Fib. The tutorial is concise and focused on only what you need to know, yet very thorough — from waves to segments to complexes. Go to LearnTheHeart.com ECG Basics. Go to video: ECG of Heart in Atrial Fibrillation on Monitor.